Riding a horse is an exhilarating experience on its own. 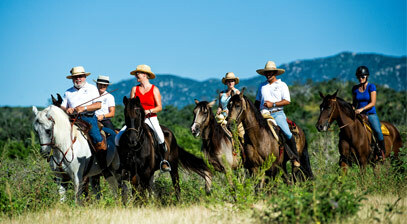 Add the spectacular scenery of Los Cabos to that ride and you push your exhilaration rapidly up the scale. The striking vistas, crisp air and varied geography of the Baja Peninsula generously lend themselves to the pleasures of the ride. You’ll be in good hands—and on good hooves—when you employ the services of Cuadra San Francisco, the only professional equestrian center in Los Cabos. Owned by the master horseman, Francisco Barrena, Cuadra San Francisco serves riders from beginners to experts, and welcomes family riding excursions. Barrena learned to ride horses before he could walk, and his 35 years of equestrian endeavors include years of training professional riders in Mexico City. A Ride That Will Linger in Your Mind: Riders can experience the peninsula’s beautiful natural diversity, from stark desert and rock formations to its pristine white beaches. All rider skill levels can be accommodated in Los Cabos, from the greenest of greenhorns to the reincarnation of John Wayne. You’ll get personal attention in horse selection and stirrup adjustment, plus a brief lesson for the inexperienced. Guides are radio-equipped to cover any contingencies. Getting the Cabo experience from the back of a horse is a visionary event—some people have returned year after year to saddle up for the adventure again. 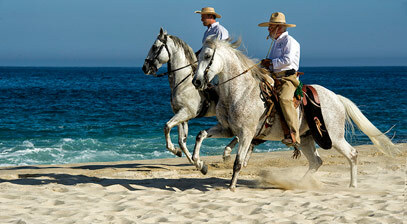 Experience Baja’s beautiful trails and terrain up close and personal—on the back of a well-trained, happy horse. You’ll see sights that will linger in your mind for a lifetime. 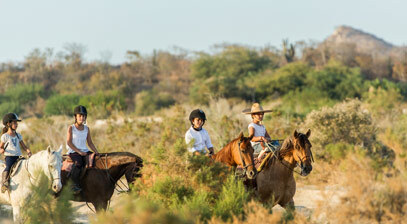 One Hour - Enjoy a desert trail ride into the hills of Cabo Real to see the Great Thorn Forest or ride along a beautiful beach. Two Hours - Take a ride into the desert, passing through the Arroyo San Carlos or Venada Blanco viewing awe-inspiring rock formations and narrow canyons. Minimum 4 years old to ride. Cuadra also offers horse-drawn carriage rides to various locales, perfect for weddings, parties and group events. The company's fantastically trained dancing horses are also available to amaze and beguile your family and friends at group gatherings.